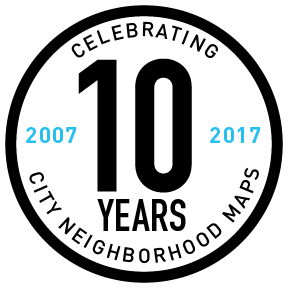 Ork Posters offers digital canvas prints of the neighborhood maps or anatomy designs that can be customized by color and size. Choose from any of our poster or print color combinations or come up with your own colors. 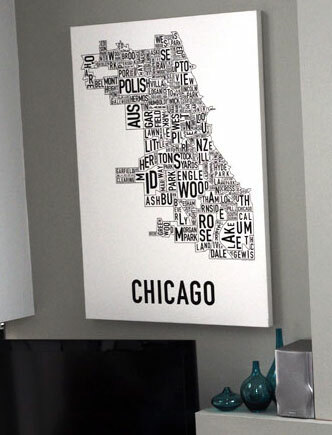 Customize the size, based on the proportions of the city shape, up to 48″ wide. Because the canvases are made to order, they take 2-3 weeks for production, sales are final and full payment is required upon ordering. We offer the canvases pre-stretched, ready-to-hang, on a 1.5″ depth wood frame with a gallery wrap finish (the background color wraps around the sides). We also offer the canvas rolled (unstretched) if you’d like to use a local framer or art shop, or DIY if you know how. 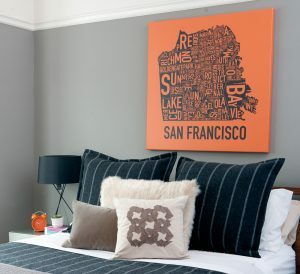 The rolled canvas option also offers more affordable shipping then the pre-stretched option. The ROLLED CANVAS (unstretched) can be purchased if you would like to stretch it yourself or take it to a local frame or art shop. The shipping cost is $12 in the US (international, please email us for the shipping cost) and sales tax will be charged if shipping within Illinois. If you select the canvas to be three or more custom colors, there is a $10 setup fee. To see canvas pricing, first select the city you'd like to order. The "Size & Price Options" dropdown will then populate with common sizes available for that city. 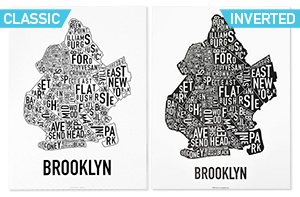 Canvas sizes are based on the particular shape of the selected city. If you don't see your preferred size, use the comment box below to send an inquiry to us. Please note: only ROLLED canvases are available for shipping outside the USA. If you'd like to move forward with a custom canvas, please fill out the rest of the form and submit it to us. It does not lock you into a purchase! We'll reply with a confirmation, requests for clarification, and details for providing payment within two business days. Canvases generally take 2-3 weeks for production. Colors are completely customizable. Unfortunately, we cannot print metallic inks. Use color combinations you see on our website or describe custom colors in detail. You may also email an image to us, or use the Pantone Color search website to find colors you like. Please specify one background color and one foreground color, unless you would like a multi-color design. Any canvas with more than two colors that does not match a current multi-color print incurs a $10 file set-up fee.